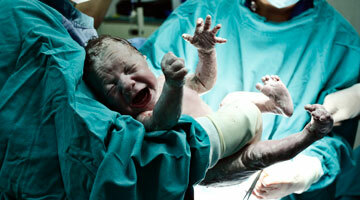 The medical reasons why you might need to have a C section for the delivery of your child are relatively few. The most important one would be some kind of complication occurring during the course of labor, either the baby is not tolerating labor so now you are having what is called emergent or urgent Cesarean section, mom having a medical condition that’s deteriorating such as high blood pressure or some other medical condition she came in that is not going to tolerate the the stress of labor and then probably the largest category during labor would be what we call arrest of progress; either the baby is not coming down or the cervix is not continuing to dilate and it’s a judgment call. but those are the most common reasons people make the decision during labor to have a Cesarean. The decision to have a Cesarean that’s medically indicated prior to labor would be things like, prior surgery that might complicate the vaginal delivery, a breech presentation, multiples; those are probably the most common reasons why people would have a planned medically indicated Cesarean.